A brief history of the famed department store. Between April 2000 and the end of October 2004 I was an employee of Macy’s, the World’s Biggest Store, as an ad copywriter. I was in charge of writing a line or two of descriptive copy, as well as listing the prices and product numbers, that appeared in the various catalogs that were released several times a year, as well as newspaper ads that ran in the Times, as well as newspapers up and down the east coast. The trickiest part was always the very small print that went at the bottom of each ad, that listed the discounts you got with coupons but also what products could not be gotten at a discount with those coupons. There were, and still are, a lot of asterisked and daggered listings in the floorlines, which was Macy’s lingo for the small print. I had answered an online or perhaps even a print ad (this was 2000, eons ago now) and interviewed with copy chief Larry S., with whom I had an immediate rapport and who remains a friend to this day. Unfortunately, he was moved aside early in my tenure and replaced by a harridan named Ali L., who despised me from the first and delighted in humiliating me in the offices within view of the other workers after I had made a mistake or offended her in some way, which wasn’t hard to do. After nearly four years of torture, the copy department was reorganized and my job eliminated. It was almost a relief. I considered it an honor to work at Macy’s, though, despite my troubles. It’s still at the bottom reaches of my resume; I have had to lop off the twenty years’ experience I had before Macy’s from my resume, because you have to fool hiring managers into thinking you’re not old when you are. The World’s Biggest Store had a 142-year legacy when I began there. Macy’s New York store was founded by former whaler and businessman Rowland Hussey Macy in 1858 at 6th Avenue and West 14th Street. From the start, Macy’s trademark has been a red star: Macy had one tattooed on his hand during his whaling days. On the rear of Macy’s original location on West 13th near 6th, red stars can still be seen as part of the building ornamentation. 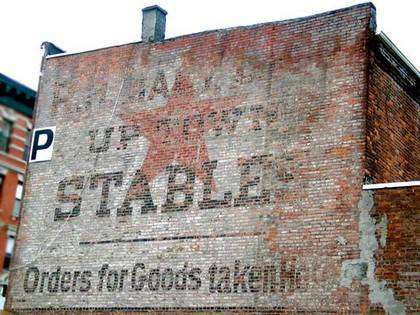 This painted sign, which was on West 148th Street between 7th and 8th Avenues (which is easier than saying Adam Clayton Powell, Jr. Boulevard and Frederick Douglass Boulevard) was probably the oldest Macy’s ad in existence in 2005. Judging from the design and letterforms it dated to the 1875-1880 period. At the time, Macy’s rented stables uptown that housed wagons for shipping parcels. Around the mid-2000s this old ad was eliminated when the building it was on, adjacent to a police precinct parking lot, was razed. Unfortunately there doesn’t seem to be a way to landmark painted ads like this. After a couple of decades on 6th Avenue and West 14th and later, West 18th Street, in 1902 Macy’s moved to a magnificent building that after several additions and acquisitions takes up nearly the entire block between Broadway, 7th Avenue, and West 34th and 35th Streets designed by architects De Lemos & Cordes. Macy’s has grown to a retail empire consisting of seven divisions with store locations in 45 states, Washington, D.C., Puerto Rico, and Guam. There are now nearly 100,000 Macy’s employees. West 14th Street, now a cacophony of cheap—ahem, affordable—mom and pop shops (and I really shouldn’t complain about a rare street in Manhattan that hasn’t yet been corporatized) retains just a few traces of its old era as the beginning of 6th Avenue’s Ladies’ Mile, recently revived with the additions of Bed Bath & Beyond and Old Navy stores in the grand old buildings that housed department stores in the early 20th century. The old Macy’s store is still standing on 14th Street just east of 6th Avenue, but there is little trace of the building’s former tenant until you round the corner to the back of the building on West 13th Street. There are quite visible remnants of Macy’s in a building now occupied by The New School’s Arnhold Hall. 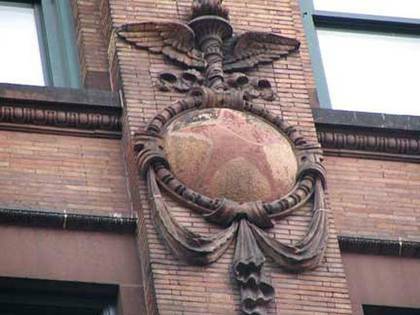 This, too, was part of the old Macy’s building, a fact made clear by the presence of eight ornamental friezes that still, after over a century, sport the Macy symbol: a red star—Rowland Hussey Macy’s tattoo. I did not work in the Macy’s in Elmhurst, Queens, at Queens Boulevard and 55th Avenue. However, this building has a quirky history that I can’t help but mention. This was the site of an epic struggle between The World’s Biggest Store and a local homeowner, Mary Sendek (some accounts spell it Sondek). 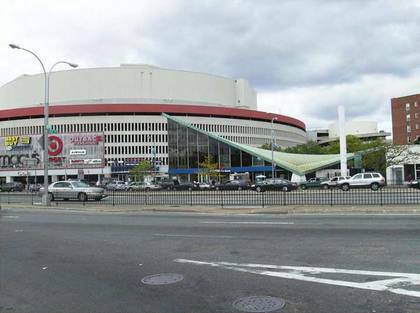 Mary and husband Joseph had purchased property at Queens Blvd. and 55th Avenue in 1922 and built a modest home there, raising a family; when Macy’s arrived after Joseph Sendek’s death and offered to buy the property, Mary refused to budge, even after Macy’s offered her five times what the Sendeks spent when they purchased the property. Macy’s eventually cut a notch in the new circular structure to evade the property line. 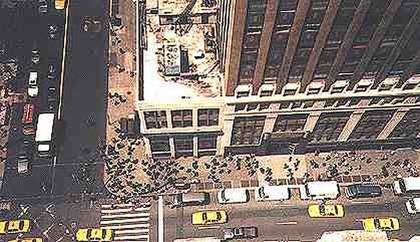 Macy’s copy department from 2000 to 2004 was on the flagship’s 17th floor, facing 7th Avenue. When things were still a little loosey-goosey in the early days with Larry, I’d occasionally wander out onto the building ledge on the 17th floor and point the camera north, south, and down to the pavement. Don’t worry, there wasn’t much chance of me falling because the brick railing came up to about my waist. Midtown in this area of Manhattan has changed little since the 1930s with the singular exception of the blocks on the west side of 7th between West 31st and 34th, which saw the demolition of Penn Station and the construction of the various objects that took its place in the late 1960s. It was all fun and games with the camera until September 11th, 2001, when I was on the ledge again but this time to see fighter jets screaming over Manhattan. They gave us a fee lunch that day in The Cellar. I thought it might be my last. I also did some handrailfanning while working at Macy’s. As far as I know, the World’s Biggest Store has the last remaining wooden escalators in the world, and I’d ride the wooden rails at lunch or after work. There are still a few sets of these ancient devices, which feature wooden treadles running on wood-paneled sides. Most have now been replaced by modern metal escalators, and you have to know where to find them. 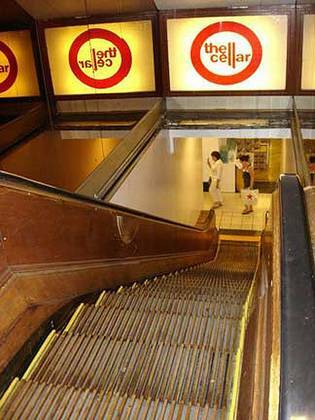 There is still a wood escalator between the 1st floor and the basement restaurant in The Cellar, where you will also find housewares. Most of the world’s wood escalators were replaced after the horrific King’s Cross fire in the London Underground in 1987. During my lunch hour I would rove all over town, sometimes taking the subway to Central Park or the Village, expanding the lunch “hour” concept a bit. I obtained some of the photos used in my site forgotten-ny.com and my book Forgotten New York on lunch hour from Macy’s. A frequent destination was the Burritoville on West 23rd Street at 8th Avenue, a now-defunct Mexican food chain. On one of my forays, I snapped the John Q. Aymar Building on 8th, my observatory senses keen as ever. I looked up the name. The Aymars were a family of merchant princes in gaslight New York from the 1820s to the Civil War era, with many generations named John Quereau Aymar. 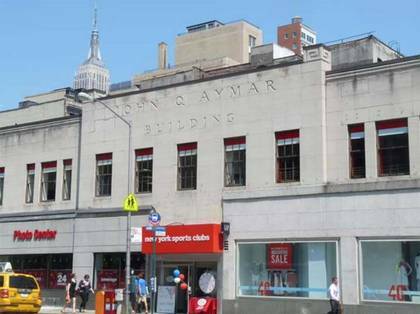 According to an item in The New York Times of August 8, 1937, the building was named for John Q. Aymar, great-grandfather of Bradish G. and Aymar Johnson, trustees of the Aymar Johnson estate, who developed the property that John Q. had purchased back in 1839. If there was time, and I always seemed to be able to make time, I’d head into Midnight Records, on West 23rd, and sift through the racks. Midnight specialized in power pop, garage band, and psychedelic records from the '60s. One day I was riffling through as usual when I felt something on the back of my neck, suspected a stray hair and brushed it away. The yellow jacket quickly got me right in the middle of the palm. Magnanimously, I let the bug live. For those who haven’t had the pleasure, it feels like a straight pin jammed in as hard as possible and the pain lingers for a few moments. It was a crazy time, with some regrets, but adversity builds character.